I’m currently in clean out mode for my pantry and fridge. I try to do this every couple of months in an effort to get rid of random things I have laying about. At any given time you can look in my freezer and see tons of ziplock baggies with small portions of unused broth, stock, beans, veggies… I could go on. When you only cook for two people you don’t always need a whole can of artichokes or black beans.So while we may eat some strange combinations for a week, there are times when these random baggies come together and make something yummy. And since this blog is about food I make and eat in my home at any given time, I decided to post it. Enter stage left: black beans, red beans, and chipotles. 1. Throw everything a blender or food processor and combine. You may need to add a small splash of water to get things grooving. 2. Optional: This can be served hot or cold. I ate it cold but to heat just put dip in a baking dish and place in the oven at 350 for about 15 minutes. A great idea would be to top with some shredded cheddar cheese. 3. Serve with chips of choice. 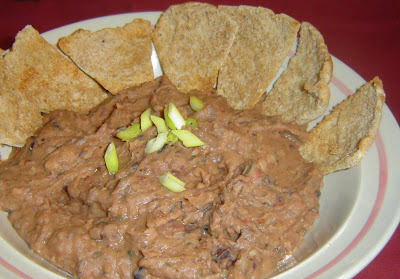 Thoughts: Its bean dip with chipotles, this is a win in my book. Later this week I will be posting a recipe that I used the dip in. I'm with you on the challenges of cooking for two. I usually cook big batches of stuff like lasagna and curry and freeze them in servings for two for quick weeknight meals. I've found that I can wash and reuse freezer bags as long as I haven't been storing raw meat in them (too gross). This dip sounds great. I haven't gotten my dining partner around to pureed beans, but I'll keep trying. That's an awesome dip. Especially with football season around the corner. Just perfect!